On September 7, 2010, the Tomball City Council voted down a proposal to make English the official language of the city, and it voted down a measure that would have forbidden illegal immigrants from owning and/or renting property and operating and/or owning businesses. While the boom of the railroad lasted less than a decade, the oil and gas industry began to leave its mark on the area. Oil probe instruments often indicated that oil was just underneath Tomball, especially after the Spindletop gusher in Beaumont. Although early exploration came up dry, the town remained a frenzy of activity for those who dreamed of oil. Undaunted by the challenges, the persevering spirit of Tomball's citizens proved rewarding when a drill hit a 100-foot (30 m) gusher of oil on May 27, 1933. Tomball, which people began to call "a floating island of oil", was immediately flooded with over two dozen oil companies, which drew thousands of workers and boosted the economy like never before. One major player, the Humble Oil Company, struck a deal with the town through which they would provide gas free of charge to the residents in exchange for rights to drill on the land. This agreement lasted until 1988, when the reservoirs began to be depleted. 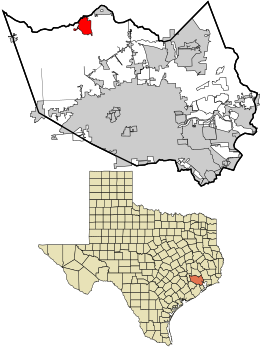 Tomball incorporated in 1933. Because of the 1933 incorporation, Houston did not incorporate Tomball's territory into its city limits. Tomball continued to grow over the years and hit its second major boom after World War II. People began to desire a more comfortable life, so the entire area saw a shift of Texans migrating from the "big city" to the countryside. In Tomball, people could escape some of the disagreeable qualities of the city, like high taxes, traffic, and crime, but still enjoy the closeness of jobs, culture, and entertainment. In the 1970s, Tomball's population again soared. The entire "Sun Belt" experienced a huge influx of residents who desired the affordable land and housing, nice weather, low taxes, and abundant job opportunities. Over the next 20 years, Tomball's population would increase from 16,000 people in the school district area to over 85,000 residents. Today, the population within the city limits is up to 10,753, according to the 2010 U.S. Census. Over 80 percent of all homes in the area were built since 1970. Tomball is located at 30°5′56″N 95°37′8″W﻿ / ﻿30.09889°N 95.61889°W﻿ / 30.09889; -95.61889 (30.098905, -95.618899). The climate in this area is characterized by hot, humid summers and generally mild to cool winters. According to the Köppen Climate Classification system, Tomball has a humid subtropical climate, abbreviated "Cfa" on climate maps. In the city, the population was spread out with 25.3% under the age of 18, 10.6% from 18 to 24, 29.8% from 25 to 44, 18.6% from 45 to 64, and 15.7% who were 65 years of age or older. The median age was 35 years. For every 100 females, there were 87.1 males. For every 100 females age 18 and over, there were 83.0 males. The median income for a household in the city was $37,787, and the median income for a family was $45,764. Males had a median income of $38,059 versus $26,799 for females. The per capita income for the city was $20,331. About 4.5% of families and 7.3% of the population were below the poverty line, including 6.3% of those under age 18 and 17.6% of those age 65 or over. Tomball's sister city is Telgte, Germany. The two cities participate in foreign exchange student programs. The high school also receives exchange students from other areas, such as Armenia. Harris County operates a tax office at 101 South Walnut Street in Tomball. The North Harris County Regional Water Authority form by State legislation as a taxing entity, which is located in Voting District No. 2. The Texas House of Representatives bill that created the water authority, HB 2965, was signed into law on June 18, 1999. On January 15, 2000 voters voted to confirm the creation of the authority in a special election.. It taxes the cities water customers, however it does not provide water services to Tomball, Tomball has its own water supply. Changed the part about the NHCRWA supplying Tomball water service, Derek Townsend, Tomball City Council Person Position 4, 12/4/18. Over 1,000 autogyros in the world are used by authorities for military and law enforcement, but the first US police authorities to evaluate an autogyro are the Tomball police, on a $40,000 grant from the U.S. Department of Justice, together with city funds, costing much less than a helicopter to buy ($75,000) and operate ($50/hour). Although it is able to land in 40-knot (74 km/h; 46 mph) crosswinds, a minor accident happened due to a wind gust. Harris County Housing Authority (HCHA) operates The Retreat at Westlock, a public housing complex for seniors, in an unincorporated area away from the Tomball city limits, along Texas State Highway 249. and near Farm to Market Road 1960. It has 166,762 square feet (15,492.7 m2) of space, and has 140 units. Residents may be aged 65 or older. The complex began taking occupants in May 2017, and completion was scheduled by fall 2017. Prior to the development of the complex, residents of area subdivisions expressed opposition to the addition of low income housing in their areas. The HCHA set a ban on visitors under age 62 from being present at The Retreat at Westlock for periods longer than three days each, due to the opposition from the surrounding areas; it is, as of 2017, the only HCHA property with this rule. The city of Tomball is primarily served by FM 2920 (Main Street) east to west and State Highway 249 (Tomball Parkway) north to south. David Wayne Hooks Memorial Airport, a general aviation airport, is located outside of the Tomball city limits in northwest Harris County. On June 27, 2007, the Texas State Legislature approved Tomball's request to annex Hooks Airport even though the airport does not border the Tomball city limits. Since the airport is in the city of Houston's extraterritorial jurisdiction, the city of Tomball had to get permission from Houston to annex the airport. The city is served by Tomball Regional Medical Center, located at 605 Holderrieth Boulevard. It is a full-service 357-bed facility hospital providing special expertise in cardiovascular disease, cancer care, emergency services, digital diagnostic imaging, physical rehabilitation, sports medicine, and comprehensive wound and lymphedema care. Tomball Regional Medical Care is owned by HCA Healthcare Inc.
Pupils who live in Tomball attend schools in the Tomball Independent School District. The district contains eight elementary schools (Tomball, Decker Prairie, Lakewood, Timber Creek, Creekside, Canyon Pointe, Willow Creek and Rosehill Elementary Schools). The schools also include a bilingual program. There are also five intermediate schools (Northpointe, Tomball, Creekside, Timbercreek, Oakcrest, Beckendorf-closed down in 2009), two junior high schools (Tomball and Willow Wood Junior High Schools), and two high schools (Tomball High School and Tomball Memorial High School) within Tomball ISD. The Texas Education Agency released the 2017-18 accountability ratings for school districts across the state and Tomball ISD earned an overall "A" rating. Tomball ISD is only one of 153 school districts and charter schools receiving an overall A rating. TISD earned 94 of 100 possible points overall. Concordia Lutheran High School (9-12) is a private school in Tomball. There are several private schools in surrounding areas in northwest Harris County such as St. Anne Catholic School (PK-8), Salem Lutheran School, Rosehill Christian School, Northwoods Catholic School (now closed), Covenant Academy, St. Edwards Catholic School, Rosehill Christian School (K-12), Trinity Lutheran School, Cypress Christian School (K-12), Northland Christian School, and Great Oak School a Waldorf School (PK-8). St. Anne Catholic, established in 1984, originally held its classes at St. Anne Church; that year it had 16 Kindergarten students and 13 first grade students. It had had 380 students in 2015. That year Joseph Noonan became the principal. Lone Star College (originally the North Harris Montgomery Community College District) serves the community. The territory in Tomball ISD joined the community college district in 1982. Tomball is served by Lone Star College - Tomball, a member of the Lone Star College System. A branch of the Harris County Public Library, located in Tomball College, is a joint project between the college and HCPL. The United States Postal Service operates the Tomball Post Office at 122 N Holderrieth Blvd, 77375-9998. ^ "http://www.tomballtoday.com/newsarchives/archivedetails.cfm?id=667 Archived 2014-07-14 at the Wayback Machine "City launches social media sites to reach out to tourists - Jul 21, 2011"
^ "Profile of General Population and Housing Characteristics: 2010 Demographic Profile Data (DP-1): Tomball city, Texas". U.S. Census Bureau, American Factfinder. Retrieved June 26, 2012. ^ O'Hare, Peggy. "Tomball votes down housing ban on illegal immigrants." Houston Chronicle. September 7, 2010. Retrieved on September 8, 2010. ^ ""History of City of Tomball"". Archived from the original on 2012-05-28. Retrieved 2012-08-05. ^ Hudnall, Ken; Hudnall, Sharon (August 15, 2005). Spirits of the Border V: The History And Mystery of the Lone Star State. 5. Omega Press. p. 454. Retrieved 2012-12-19. ^ "Geographic Identifiers: 2010 Demographic Profile Data (G001): Tomball city, Texas". U.S. Census Bureau, American Factfinder. Retrieved June 26, 2012. ^ "Data Tools: 1981-2010 Normals for Hooks Memorial Airport". National Centers for Environmental Information. Retrieved 2017-07-10. ^ "NOWData: Monthly Summarized Data for Bush Intercontinental Airport". National Oceanic & Atmospheric Administration. Retrieved 2017-07-10. ^ "Branch Office Locations Archived 2008-04-04 at the Wayback Machine." Harris County Tax Office. Accessed October 13, 2008. ^ "Voting District No. 2 Archived 2007-08-12 at the Wayback Machine." North Harris County Regional Water Authority. Retrieved on April 25, 2009. ^ Home page. North Harris County Regional Water Authority. Retrieved on April 25, 2009. ^ Supgul, Alexander. Tomball Police Equipped with Gyroplane 22 March 2011. Accessed 13 September 2011. ^ Hauck, Robert S. Broadening horizons[permanent dead link] AirBeat Magazine July/August 2011. Accessed September 13, 2011. ^ ALEA 2011: Autogyro debuts in the sky over Texas 22 July 2011. Accessed September 13, 2011. ^ Hardigree, Matt. Flying the Police Aircraft of the Future, Wired (magazine) Video September 13, 2011. Accessed September 13, 2011. ^ "CEN14TA116" "Probable Cause" NTSB, April 23, 2014. Accessed: May 16, 2014. ^ "Our Properties." Harris County Housing Authority. Retrieved on January 1, 2019. "The Retreat at Westlock Address: 24055 SH 249, Tomball TX 77377"
^ Hill, Glynn A. (2017-06-27). "Harris County Housing Authority set to open senior facility in Tomball". The Potpourri (Tomball Edition) at the Houston Chronicle. Retrieved 2019-01-01. ^ "Tomball gets OK to annex airport / Legislation clears one hurdle in city's quest to buy Hooks." Houston Chronicle. July 5, 2007. ^ "Elementary Zones 2008-2009[permanent dead link]." Tomball Independent School District. Accessed September 13, 2008. ^ "Bilingual Zones 2008-2009[permanent dead link]." Tomball Independent School District. Accessed September 13, 2008. ^ Peyton, Lindsay (2015-01-16). "St. Anne Catholic School plans for 30th anniversary". The Spring Observer at the Houston Chronicle. Retrieved 2017-03-25. ^ "St. Anne Catholic School welcomes new principal, 335 students". The Potpourri at the Houston Chronicle. 2015-08-24. Retrieved 2017-03-25. This page was last edited on 10 February 2019, at 22:37 (UTC).